Sunday night after hubby's jog to the park, he needed some late-night energy booster/dinner. Since he had a steak lunch, he wasn't up for a huge dinner. So he grabbed some toast and started jamming. 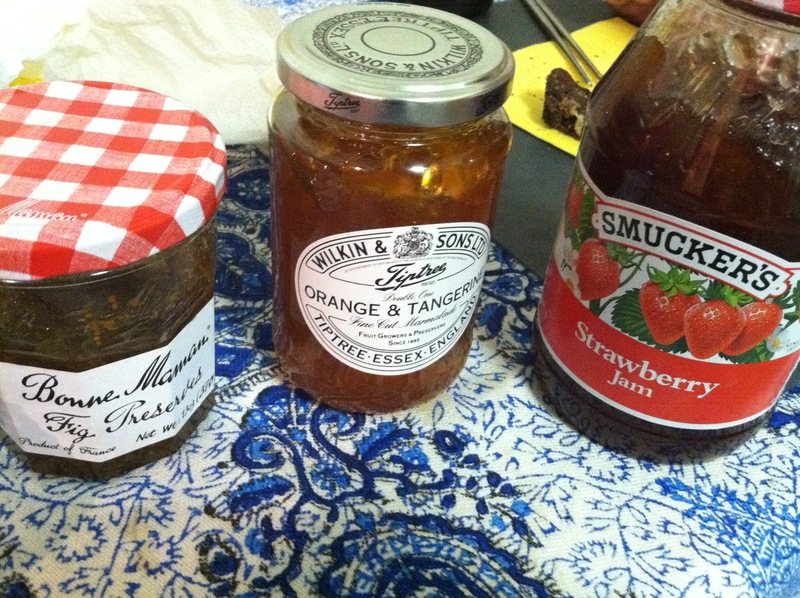 Jelly, jam and preserves are all made from fruit mixed with sugar and pectin. The difference between them comes in the form that the fruit takes. Pectin is an indigestible carbohydrate (fiber). It is found in the cell walls of most fruit. When heated with sugar in water, it gels, giving jam, jelly and preserves their thickness. But never beats the good ole' taste test to really understand the cross-cultural and inter-species differences. 1. Smuckers is too institutionalized, reminiscent of school cafeterias (although I hold a different opinion - they remind me of my childhood PB+J sandwiches). Hubby also disliked the glucose amount in the ingredients. 2. Fig jam is pretty authentic, but too sweet. Might taste good with cheese to balance out the sweetness. 3. British marmalade retains the most original flavor, and you can actually see and taste the zesty thin orange peels. Hubby's favorite, not so much mine. This is mainly based on hubby's own opinions, which is actually the exact opposite of the market trends. 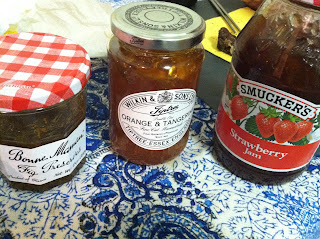 According to industry analysis, jam sales grew consistently bewteen 2000-3, while jelly sales fell slightly from 2000-1. 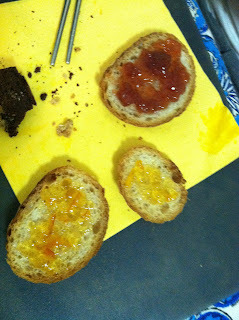 Marmalade remained stable but significantly less than its counterparts. Now why can't there be more edible scientific experiments like this? No wonder I never enjoyed science class back in the day! Btw cool fact of the day: The average child will eat 1,500 peanut butter and jelly sandwiches by high school graduation*.